The TSGS Cruiser: Grandchildren Are Great! 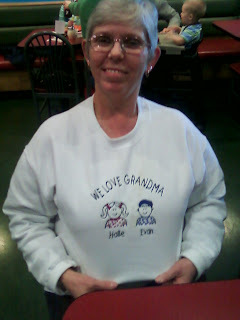 Here is a very proud grandmother with a new sweat shirt with the names of her grandchildren! Becky West is showing off the gift from Halle & Evan she got late, last year. I thought this was good timing since my son & family are coming into Evansville to visit... they live near King's Island northeast of Cincinnati. With Memorial Day weekend coming up, I am sure many will have family reunions or other types of get togethers. This coming Sunday, my Selvin High School Freshman Class will have a class reunion (our small high school was closed due to statewide "consolidation" in 1962 making our class the last Selvin Freshman Class). Selvin is in northeastern Warrick Co., IN. Yellow Banks Park & Recreation Center is just north of Selvin... agreat place to enjoy Memorial Day weekend. Friday, Becky & I will be decorating graves of family members, a serious tradition (duty, actually) that Mom faithfully did each year to remember family that had passed on. I drove her around for years, so after she died I ended up doing this each year. Over the years, I have found new information about my family as I went from cemetery to cemetery. Reminder to all - Don't forget the purpose of Memorial Day is to remember our fallen Servicemen and women. I will be attending Four Services. I agree with the comment above that Memorial Day is a day to remember our fallen soldiers... as genealogists, we know a lot of soldiers in our family that have fallen in many wars. Our family also takes the time to remember all of our family that have gone before us. We often forget that although the soldier killed in action gave the ultimate price, his family lost a loved one: a spouse, child, parent, cousin or other family member... they should be remembered, as well. Guess Where This Lion's Head Is Located!